If you're looking for those fancy tuxedo jackets that you see Celebrities wear, you only need to know one brand Manzini. Manzini specializes in making Red Carpet style fancy tuxedo style jackets and blazers are a World apart from some lame rental tux. 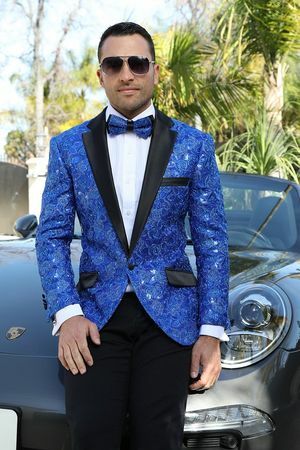 This blue sequin tuxedo jacket has side vents and fancy pattern with a modern fit for that modern look you seek.